Advantages: Interesting techniques, easy to understand text, competent modelling, plenty of images to compliment the narrative. 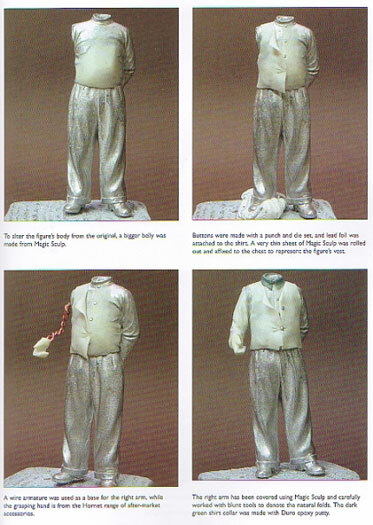 Conclusion: A very good primer for those just starting out in the field of figure modelling. You have just completed a diorama and want to bring it to life. Or maybe your latest vehicle needs something to provide a sense of scale. The only problem is...you’re not a figure modeller. Many books assume you know something about the subject first whereas this publication takes the reader back to the beginning. If you already have some experience in this area then the author may inspire you to try his approach. After a foreword by none other than Shep Paine, Mark Bannerman dives into the fundamentals. Here we find a discussion on the types of figures on the market, the scales available, and the tools necessary to prepare these items. This includes sections where both minor and major conversion work is highlighted as well as the more advanced techniques involved in scratch-building. Most of the topics chosen are of a generic nature so the modeller can apply the procedures to their own subject. After choosing and possibly modifying your figure, it is the painting and finishing stage that can send the biggest shudder through one’s spine. This takes up the largest part of the book and deservedly so. The author lets us know how he handles enamels, acrylics, and oils as each has their own idiosyncrasies. Naturally the workings of highlighting and shading are explained and a varied selection of subjects is presented to help illustrate this. These include a 54mm Black Watch 42nd Highlander Crimean War soldier, a 120mm Vietcong figure, a 1:48 scale German pilot and even a 30mm fantasy figure. Most publications concentrate on images with accompanying limited captions to explain what is happening, but a different approach is taken here. A lot more text is devoted to the methodology to ensure the reader is fully informed of what the author is trying to do. This is just as well as some of the step-by-step photos are not sufficiently clear in showing these transitions. The fault is the lack contrast after printing and unfortunately many such books share this failing. Mark passes on many tricks to the budding painter and all are designed to make the task less intimidating. He also tackles the finer points of painting shields, tartan, horses, and of course faces. In finishing off the publication there is a Gallery which features inspiring work by Eddy Vandersteen, Le Van Quang, Denis Allaire and Lee Dobson. 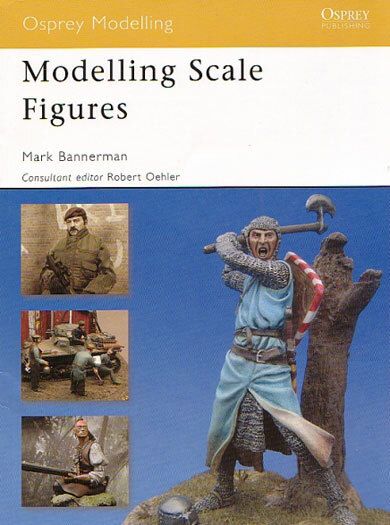 The author has produced a very good primer for the modeller that wants to try their hand at figures. It doesn’t get overly complicated and assumes the reader is just starting out in this field. The techniques are explained with the use of competent brushwork and the broad nature of the information means it can be used for a variety of subjects. So if you’re about to build your first figure or just want to try different techniques, you can’t go far wrong with this book.